My hotel is a creaking structure that defines the term “ramshackle.” The upper story is clad with flaking exterior chipboard and my room is a lean-to off the lobby, so the slightest step or voice sounds as if it is directly beside me. The breakfast (included) included the worst cup of coffee — no exaggeration— I’ve ever had, and I’ll drink any coffee—still, all part of the adventure. 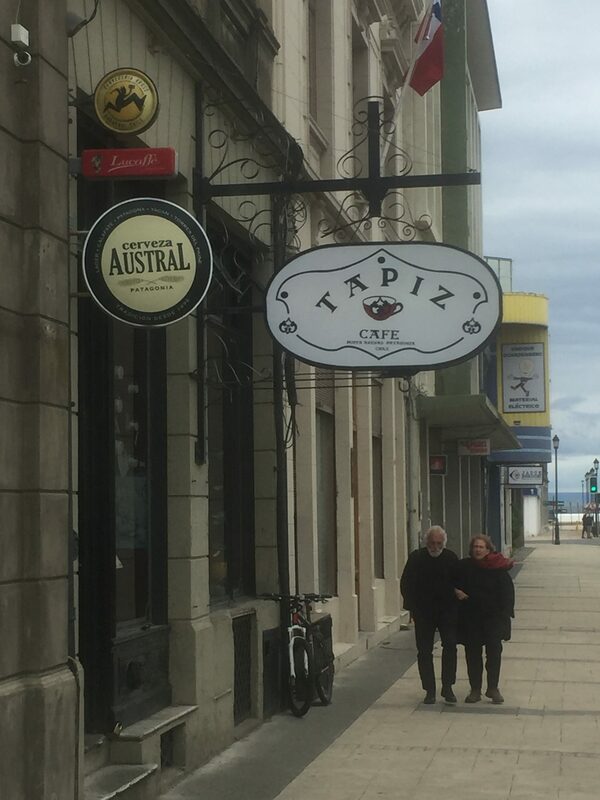 Ventured out into the town, made arrangements to boat out on the straits tomorrow, then went directly to Tapiz, a cafe I passed last night, resolving then to return in the morning. Another warm, wood-lined space, this one with overstuffed chairs in the window and tables made of thick-slabbed tree trunks. They redeemed coffee for consumption, though their breakfasts seem to be primarily huge slabs of pie (echoing the theme of their tables). My very loose guidebook (as marked by the title of this trek) is Bruce Chatwin’s beautiful if quirky book, In Patagonia. I imagine I’ll post several “pointless essays” on it as the journey unfolds and hope to one day teach it in a walking class. Given how otherworldly Patagonia emerges in his book (and in Darwin, Hudson, and Bridges), it seemed necessary to walk about in it, but today was simply sight-seeing—inventorying the places and objects Chatwin describes. The prompt —the ficelle in Henry James’s terms—for In Patagonia is a piece skin or hide covered with coarse red hair in a glass cabinet in Chatwin’s grandmother’s house. She claimed it was a piece of brontosaurus hide given to her as a wedding present by a cousin, Charlie Milward, who was an adventurer in Patagonia. Although not a bit of brontosaurus, the artifact was part of the remains of a long-extinct animal called a mylodon— a giant ground sloth—that Milward had discovered in a cave in southern Chile. Young Chatwin was fascinated by the hairy item and, some years later set out to find not a brontosaurus or mylodon, but instead a family story. He ended up finding many many stories that make up the 90+ chapters of his book. 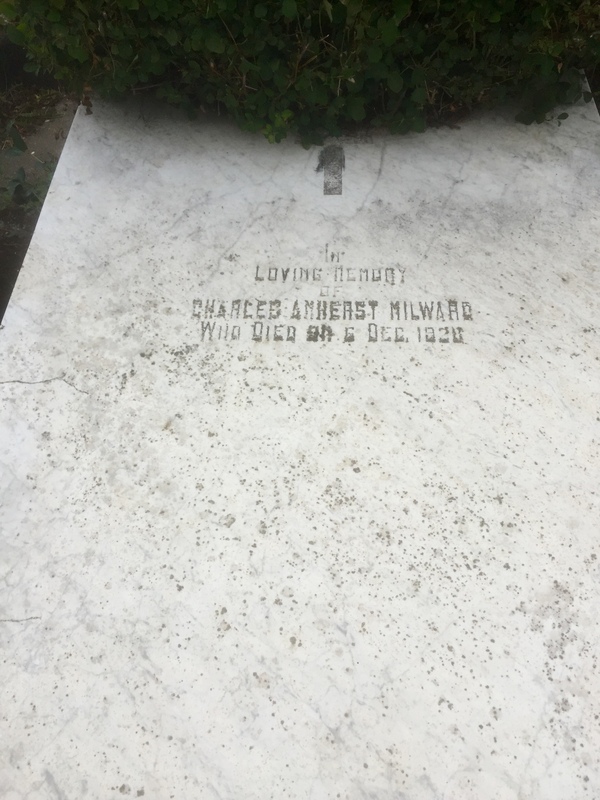 Charlie Milward had a varied career. Not only a searcher for long-gone animals, he sailed, built and repaired boats, ran a foundry, and even served as the British consul at Punta Arenas. 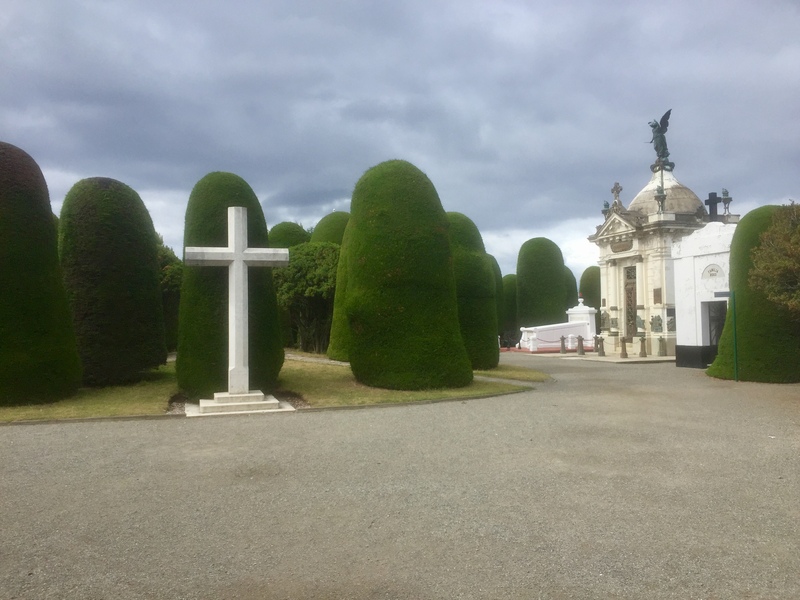 After long wandering in the northern parts of Patagonia, Chatwin finally arrives in Punta Arenas, visiting the places I visited today. 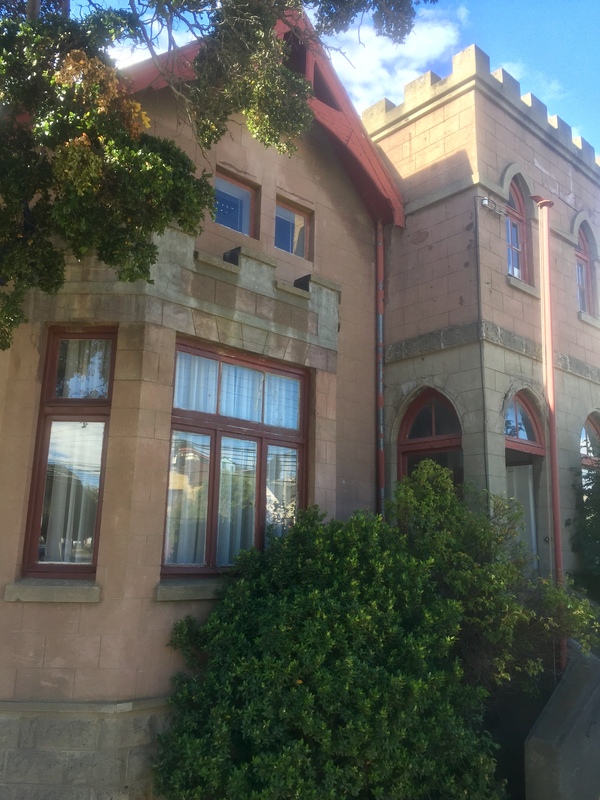 Milward built a magnificent house—part church, part castle, all unusual—though today it is crowded between other buildings including on one side a large, unremarkable warehouse. Its primary claim to fame is that Shackleton stayed there while organizing the rescue on Elephant island. Around the corner is St. James’s Anglican Church—Milward had a pew there—but today it was locked so all I could do was admire its outward simplicity. Perhaps the most important draw for Chatwin was the Salesian Museum which, I can confirm, does have several pieces of hairy mylodon flesh displayed in their natural history section (no mention there of Milward or Chatwin). Entering the museum chapel called attention to the weather in an indirect way. Like many churches, it has double doors in the vestibule, with the outer ones open when the church was. The space there was a sunny but also still space, so for the first time I watched flies circle without being buffeted by the Magellanic winds—completely arresting. 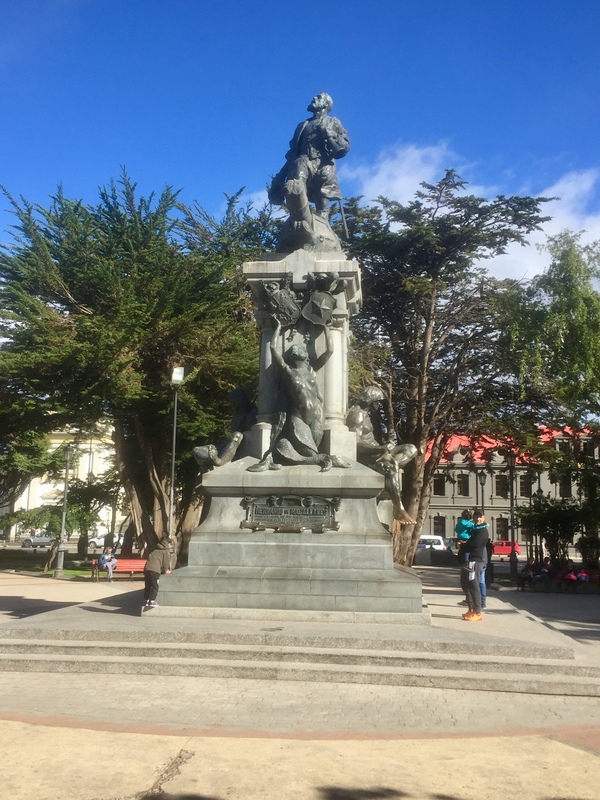 Chatwin also describes the ceremony commemorating the Magellan statue in the middle of the main square, commenting that “A statue of Magellan pranced over a pair of fallen Indians, which the sculptor had modelled on ‘The Dying Gaul’.” And he visited the cemetery— an amazing complex of plants, paths, and mausoleums—containing the graves of many important Punta Arenas citizens, including Charlie Milward. Although Chatwin set today’s agenda, he did not control it. In my time trekking the Camino Santiago, I learned (from a friend) how to see churches, particularly old historic ones. Forgive me for stating the obvious, but seeing a beautiful old church requires slipping in quietly, finding a pew near the apex (if cruciform) and simply letting your eyes play over the scene (which has been designed to be seen) while listening intently to the sounds which rush about almost silently. After your eyes and ears have been caught by most (never all) the scene offers, you are free to circumambulate the building, pausing at the various chapels for however much time they demand. Today I got to visit the Punta Arenas Cathedral just on the main plaza, and the more elaborate church of the Salesian mission. I want to say they were somehow typical, as all Catholic Churches participate in a certain typicality, but of course there were many distinguishing features. The Cathedral, which apparently burned at some point last century, was clean and spare. No exposed wood, all masonry and stucco, limited stained glass and paintings. All focus is on a mosaic Jesus in the upper apse. The Salesian chapel was full of stained glass and generally grander. The common decorations — at least what caught my eye—were bas relief marble carvings of Da Vinci’s “Last Supper” in minute detail fronting the altars. Perhaps a regular feature in Catholic Churches but one I had not noticed. 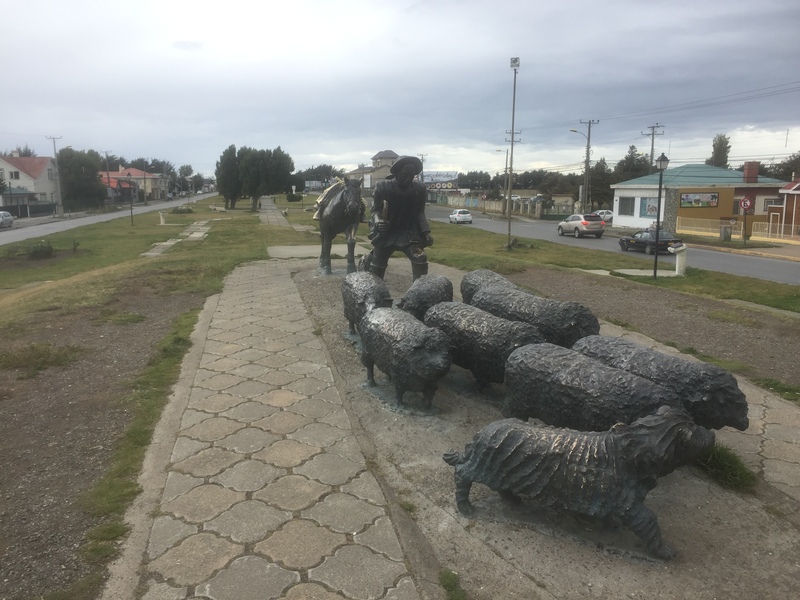 After exiting the city cemetery, I followed Boulevard Bulnes past the sheep farming memorial, a multi-object bronze sculpture of a sheepdog, herd of sheep, shepherd and a saddled but un-ridden pony. Like the foot of the Native American on the base of Magellan’s statue, the saddle of the pony was polished bright by countless visitors, in this case mounting and dismounting for photos. Next was the horserace track Chatwin visited, concerned about his shabby dress. Given its general disrepair today, old Bruce would now have no qualms attending. From there I looped through what I think is North Beach to the water, following the beachline back to town. In that area, the houses are small, almost like vacation cabins, in a variety of styles and repair. Some new, with gambrel roofs surrounded by stern and sturdy fencing. Others sided with whatever material was available—interior tongue and groove siding, corrugated steel, sheet metal—in various stages of repair. All were fenced, creating a fortress mentality that makes me curious. Is it a current concern for crime or a longstanding colonial impulse for fortification? Whatever the reason, they prize their security systems. They do employ another, more familiar security as well. The place is crawling with dogs, some penned, some roaming freely, most loungers. I was strangely taken back to my childhood in Woodstock Virginia, remembering the days before poop bags and leash laws when everyone had a dog and they were always loose. Some might be slightly menacing (I remember a neighbor with penned German Shepherds) but we generally knew them all, so more often than not, they would barely raise their heads as we passed.